In this post, you will find the current laws for the use of drones in Singapore. Maximum flight altitude: The maximum permitted flight altitude in Singapore is 60 meters (200 feet). Maximum horizontal distance and FPV: Drones may only be operated in the direct line of sight in Singapore. Compulsory insurance: We recommend flying only with a valid aviation liability drone insurance in Singapore. Maximum take-off weight (MTOW): Drones weighing more than 7 kilograms may only be used with appropriate permits (Operator & Activity Permits). Distance to airports: Drones are not allowed to fly within a radius of 5 kilometres of an airport. Commercial pilots have to apply for an Activity Permit Class 1. For the permits, you have to plan at least 600 SGD fees (about 400 Euro). Registration can be made online here. The processing time is indicated with about 14 days. 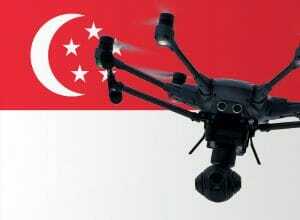 We have researched the listed drone regulations for Singapore to the best of our knowledge. We can not guarantee the correctness of the information. If you want to be on the safe side, please contact the competent aviation authority. Alternatively, you can also ask the embassy in your country for further information about the regulations. Please leave us a comment when you receive news and/or gain experience with your copter in Singapore! Drone rules in Singapore (where I live and fly) have more to them than the CAAS regulations. The National Parks do not permit flying over the 100’s of areas they administer which range from larger areas to bicycle paths. The reservoirs are considered national security assets and they ask us not to photograph them and publish on websites. Greetings. I am not a drone owner but hope to be one soon. I plan to practice daily (I live in Cairns Qld Aust) and get some degree of control before I go to Singapore for 2 weeks. I was hoping to fly the drone over the Marina Bay and bideo a 360 sequence of the City and surrounds. After reading through your info I think it is not possible. Would it be possible to seek permission from the Singapore Authorities? On an aside I see that you changed over from a DJI 2 to a Yuneec drone. Not having any experience on this subject, could you please advise me on a good drone with potential for improvement in video photography (home movies only)? I sincerely hope that I am not a pest with all these questions. By the way, I am 75 years of age but still keen to learn. It is still possible to use a drone in Singapore. We used a lot of drones in the past. I believe the DJI Spark is an excellent choice for you. That is true: National Parks are always an issue! Happy flying. I am planning to buy Phantom 3 drone and want to use in Singapore below 200meters. Does it require any license or just use? Please explain. Hi Chandra. In Singapore you can fly no higher than 60 meters and you don’t need any license but I suggest to download the OneMap SG App where you can see where you can or cannot fly in Singapore. National Parks, are NO FLY ZONES, you can not fly over any building that belongs to the state ( Ministries, Schools, Religious Buildings etc. ), plus you should check the temporary NO FLY ZONES , for example the area of Marina Bay between the last week of July and the 15 of August is a NO FLY ZONE because the preparation and celebration of National Day, same when there is the F1 GP and many more.